Diagram illustrating the relationship between the wavenumber and the other properties of harmonic waves. In the physical sciences, the wavenumber (also wave number or repetency) is the spatial frequency of a wave, measured in cycles per unit distance or radians per unit distance. Whereas temporal frequency can be thought of as the number of waves per unit time, wavenumber is the number of waves per unit distance. In multidimensional systems, the wavenumber is the magnitude of the wave vector. The space of wave vectors is called reciprocal space. Wave numbers and wave vectors play an essential role in optics and the physics of wave scattering, such as X-ray diffraction, neutron diffraction, and elementary particle physics. For quantum mechanical waves, the wavenumber multiplied by Planck's constant is the canonical momentum. Wavenumber can be used to specify quantities other than spatial frequency. In optical spectroscopy, it is often used as a unit of temporal frequency assuming a certain speed of light. 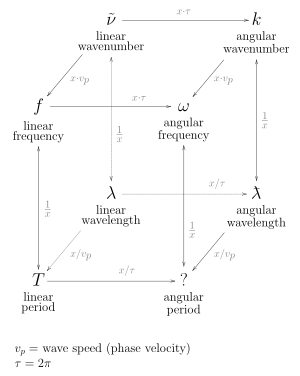 where λ is the wavelength. It is sometimes called the spectroscopic wavenumber. , where νs is a frequency in hertz. This is done for convenience as frequencies tend to be very large. It has dimensions of reciprocal length, so its SI unit is the reciprocal of meters (m−1). In spectroscopy it is usual to give wavenumbers in cgs unit (i.e., reciprocal centimeters; cm−1); in this context, the wavenumber was formerly called the kayser, after Heinrich Kayser (some older scientific papers used this unit, abbreviated as K, where 1 K = 1 cm−1). The angular wavenumber may be expressed in radians per meter (rad·m−1), or as above, since the radian is dimensionless. For electromagnetic radiation in vacuum, wavenumber is proportional to frequency and to photon energy. Because of this, wavenumbers are used as a unit of energy in spectroscopy. where k0 is the free-space wavenumber, as above. The imaginary part of the wavenumber expresses attenuation per unit distance and is useful in the study of exponentially decaying evanescent fields. Here we assume that the wave is regular in the sense that the different quantities describing the wave such as the wavelength, frequency and thus the wavenumber are constants. See wavepacket for discussion of the case when these quantities are not constant. is the phase velocity of the wave. The dependence of the wavenumber on the frequency (or more commonly the frequency on the wavenumber) is known as a dispersion relation. where E is the energy of the wave, ħ is the reduced Planck constant, and c is the speed of light in a vacuum. Here p is the momentum of the particle, m is the mass of the particle, E is the kinetic energy of the particle, and ħ is the reduced Planck's constant. Wavenumber is also used to define the group velocity. which remains essentially the same in air, and so the spectroscopic wavenumber is directly related to the angles of light scattered from diffraction gratings and the distance between fringes in interferometers, when those instruments are operated in air or vacuum. Such wavenumbers were first used in the calculations of Johannes Rydberg in the 1880s. The Rydberg–Ritz combination principle of 1908 was also formulated in terms of wavenumbers. A few years later spectral lines could be understood in quantum theory as differences between energy levels, energy being proportional to wavenumber, or frequency. However, spectroscopic data kept being tabulated in terms of spectroscopic wavenumber rather than frequency or energy. where R is the Rydberg constant, and ni and nf are the principal quantum numbers of the initial and final levels respectively (ni is greater than nf for emission). where n is the refractive index of the medium. Note that the wavelength of light changes as it passes through different media, however, the spectroscopic wavenumber (i.e., frequency) remains constant. , so often that such spatial frequencies are stated by some authors "in wavenumbers", incorrectly transferring the name of the quantity to the CGS unit cm−1 itself. A wavenumber in inverse cm can be converted to a frequency in GHz by multiplying by 29.9792458 (the speed of light in centimeters per nanosecond). ^ W., Weisstein, Eric. "Wavenumber -- from Eric Weisstein's World of Physics". scienceworld.wolfram.com. Retrieved 19 March 2018. ^ "Wave number". Encyclopædia Britannica. Retrieved 19 April 2015. ^ Murthy, V. L. R.; Lakshman, S. V. J. (1981). "Electronic absorption spectrum of cobalt antipyrine complex". Solid State Communications. 38 (7): 651–652. Bibcode:1981SSCom..38..651M. doi:10.1016/0038-1098(81)90960-1. Fiechtner, G. (2001). "Absorption and the dimensionless overlap integral for two-photon excitation". Journal of Quantitative Spectroscopy and Radiative Transfer. 68 (5): 543–557. Bibcode:2001JQSRT..68..543F. doi:10.1016/S0022-4073(00)00044-3. "Boson Peaks and Glass Formation". Science. 308 (5726): 1221. 2005. doi:10.1126/science.308.5726.1221a. ^ Hollas, J. Michael (2004). Modern spectroscopy. John Wiley & Sons. p. xxii. ISBN 978-0470844151. ^ "NIST: Wavenumber Calibration Tables - Description". physics.nist.gov. Retrieved 19 March 2018.